Last year, we told you about MaraMoja, a Kenya taxi hailing startup that is looking to change the industry. MaraMoja was founded by Jason Eisen who previously worked in the donor world. Following bad taxi experiences, Jason opted to venture into the technology world launching Mara Moja. Since launch MaraMoja has grown in leaps and bounds and recently celebrated its 1st birthday. We had a sit down with Jason where we talked MaraMoja’s journey in the local market and Trust. Maramoja Application is available both on Android, a mobile-optimized web app that works on iOS and on the web and allows you to hail a cab driver through your network. A user signs up to the service using their Facebook account which allows the service to tap into your network to identify your friend’s favorite driver. According to Jason, the engine has now been optimized such that when you sign up, the engine conducts a semantic analysis of the phone book to identify your favorite taxi drivers. Once you sign up, you are asked to give permission to the app to scan your phone book but have the option to confirm or deny these permissions. The engine then divides your phone book into four categories users on MaraMoja and users not on MaraMoja as the most primary category. The other category identifies clients and drivers from these users. It then conducts further analysis by identifies clients and drivers on MaraMoja’s network for which it identifies your favorite. It also asks if you would like to invite these special interest groups to MaraMoja. “Most people have the numbers of their favorite taxi drivers saved on their phones. After conducting the analysis, we in most instances find that one or two of the taxi driver contacts is signed up to MaraMoja and we then favorite these drivers and send them to you”said Jason. This means every time you open the app, you get to see the location of your favorite drivers, who are marked by the heart sign and then are given a choice of which available drivers you want to ride with. MaraMoja has now more than 700 drivers signed up to the service mostly through referrals.”When we launched in this market, we sought audience with taxi drivers thus creating a rapport with them. Most of our drivers are independent taxi providers which has allowed us to evade problems faced by other players in this market, who taxi drivers see as their competition”, says Jason. On average, new sign up clients send up to 30 new referrals with each successful referral bringing in Kshs 300/= worth of free rides. Jason is particularly proud of MaraMoja’s trust engine, which he says forms the backbone of the company. ” The trust value proposition is particularly perfect for application in the taxi business”, he says. “We are able to ensure our users get taxi drivers they trust or their friends trust”. Jason says MaraMoja’s trust engine merges a user’s favorite drivers plus the convenience of using an application to hail a taxi. MaraMoja also sees its pricing as a major differentiating factor for users. “Most of the competition relies on the time plus distance metrics in calculation of the price a user pays”, says Jason. “This however pits the driver versus the client as the driver wants to earn more, hence choose the longer route while the client wants to pay less will insist on a shorter route”, he says. 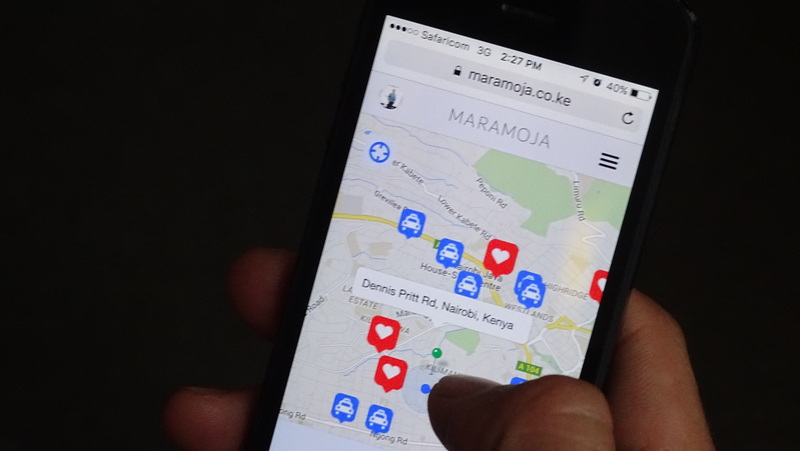 MaraMoja has created a pricing map that segments different areas in Nairobi into zones, which then informs the pricing of a ride. This means the pricing of the rides are fixed from one zone to another. MaraMoja initially witnessed a lot of traffic in Kilimani, Westlands and Lavington with new interest in Ruaka, Thika Road, Eastlands among others areas in the City. Beyond delivering services to consumers, MaraMoja has corporate clients signed up among them IRI, a US based NGO besides gaining entry into the Hub Mall in Karen. Beyond taxi, MaraMoja last year launched a pilot for the BodaBoda services in Nairobi. The service will relaunch after MaraMoja deals with problems identified during the pilot. Some of the challenges experienced included the lack of smartphones among BodaBoda riders while those with the devices would not keep charge for ling periods of time. Some of the solutions MaraMoja is looking at include looking for solutions that will charge devices from the bike as well as change the driver side of the app to allow it work from feature phones. The taxi hailing service is in the middle of closing a fundraising round following their angel round in 2014. “For this seed round we are speaking with both angels and institutional investors”. The funds will be used in optimizing the trust engine as well as expansion in other cities as well as internationally. On the trust engine, the service has recently introduced a feature on the App that allows you to view the documents of your driver in a bid to boost the levels of trust between the driver and the user. Some of the challenges faced over the last one year include how to keep the customers engaged on the app. In addition, trying to get customers to continually use the application,that when they think of taxi hailing they opt for MaraMoja as the first option. Other challenges include guaranteeing high quality in car experience for passengers using MaraMoja. Maintain high quality service for a 700 fleet cab service, for independent drivers proves a challenge. MaraMoja has been keen on enforcing the message of trust and relationships to its drivers to ensure maintain of these high standards.